If the biCompression member of BITMAPINFOHEADER is BI_JPEG or BI_PNG, lpBits points to a buffer containing a JPEG or PNG image, respectively. The BITMAPINFOHEADER’s biSizeImage member specifies the size of the buffer. The iUsage parameter must be set to DIB_RGB_COLORS. The dwRop parameter must be set to SRCCOPY. To ensure proper metafile spooling while printing, applications must call the CHECKJPEGFORMAT or CHECKPNGFORMAT escape to verify that the printer recognizes the JPEG or PNG image, respectively, before calling StretchDIBits. Because of its cascaded adaptive Huffman coding, Flate-encoded output is usually much more compact than LZWencoded output for the same input. Flate and LZW decoding speeds are comparable, but Flate encoding is considerably slower than LZW encoding. JBIG2 is an image compression standard for bi-level images, developed by the Joint Bi-level Image Experts Group. It is suitable for both lossless and lossy compression. According to a press release from the Group, in its lossless mode JBIG2 typically generates files one third to one fifth the size of Fax Group 4 and one half to one quarter the size of JBIG, the previous bi-level compression standard released by the Group. JBIG2 has been published in 2000 as the international standard ITU T.88, and in 2001 as ISO/IEC 14492. Ideally, a JBIG2 encoder will segment the input page into regions of text, regions of halftone images, and regions of other data. Regions which are neither text nor halftones are typically compressed using a context-dependent arithmetic coding algorithm called the QM coder. Textual regions are compressed as follows: the foreground pixels in the regions are grouped into symbols. A dictionary of symbols is then created and encoded, typically also using context-dependent arithmetic coding, and the regions are encoded by describing which symbols appear where. Typically, a symbol will correspond to a character of text, but this is not required by the compression method. For lossy compression the difference between similar symbols (e.g., slightly different impressions of the same letter) can be neglected; for lossless compression, this difference is taken into account by compressing one similar symbol using another as a template. Halftone images may be compressed by reconstructing the grayscale image used to generate the halftone and then sending this image together with a dictionary of halftone patterns. An overview of JBIG2 may be found in. Overall, the algorithm used by JBIG2 to compress text is very similar to the JB2 compression scheme used in the DjVu file format for coding binary images. PDF files versions 1.4 and above may contain JBIG2 compressed data. Open source decoders for JBIG2 are jbig2dec, the java-based jbig2-imageio and the decoder found in versions 2.00 and above of xpdf. An open source encoder is jbig2enc. Typically, a bi-level image consists mainly of a large amount of textual and halftone data in which the same shapes appear repeatedly and the bi-level image is segmented into three regions: text, halftone, and generic regions. Each region is coded differently and the coding methodologies are described in the following passage. Text coding is based on the nature of human visual interpretation. A human observer cannot tell the difference of two instances of the same characters in a bi-level image even though they may not exactly match pixel by pixel. Therefore, only the bitmap of one representative character instance needs to be coded instead of coding the bitmaps of each occurrence of the same character individually. For each character instance, the coded instance of the character is then stored into a “symbol dictionary”. There are two encoding methods for text image data: pattern matching and substitution (PM&S) and soft pattern matching (SPM). These methods are presented in the following subsections. 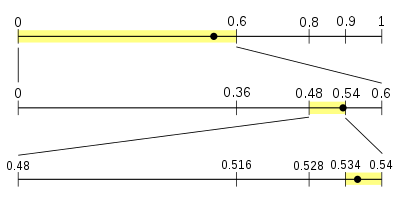 Block diagrams of (Left) pattern matching and substitution method and (Right) soft pattern matching method. Pattern matching and substitution: After performing image segmentation and match searching, and if a match exists, we code an index of the corresponding representative bitmap in the dictionary and the position of the character on the page. The position is usually relative to another previously coded character. If a match is not found, the segmented pixel block is coded directly and added into the dictionary. Typical procedures of pattern matching and substitution algorithm are displayed in the left block diagram of the figure below. Although the method of PM&S can achieve outstanding compression, substitution errors could be made during the process if the image resolution is low. Soft pattern matching: In addition to a pointer to the dictionary and position information of the character, refinement data is also required because it is a crucial piece of information used to reconstruct the original character in the image. The deployment of refinement data can make character-substitution error mentioned earlier highly unlikely. The refinement data contains the current desired character instance which is coded using the pixels of both the current character and the matching character in the dictionary. Since it is known that the current character instance is highly correlated with the matched character, the prediction of the current pixel is more accurate. Halftone images can be compressed using two methods. One of the methods is similar to the context-based arithmetic coding algorithm which adaptively positions the template pixels in order to obtain correlations between the adjacent pixels. In the second method, descreening is performed on the halftone image so that the image is converted back to grayscale. The converted grayscale values are then used as indexes of fixed-sized tiny bitmap patterns contained in a halftone bitmap dictionary. This allows decoder to successfully render a halftone image by presenting indexed dictionary bitmap patterns neighboring with each other. All three region types including text, halftone, and generic regions may all use arithmetic coding. JBIG2 specifically uses the MQ coder. Patents for JBIG2 are owned by IBM and Mitsubishi. Free licenses should be available after a request. JBIG and JBIG2 patents are not the same. ^ “ITU-T Recommendation T.88 — T.88 : Information technology – Coded representation of picture and audio information – Lossy/lossless coding of bi-level images”. http://www.itu.int/rec/T-REC-T.88. Retrieved 2011-02-19. ^ “ISO/IEC 14492:2001 – Information technology — Lossy/lossless coding of bi-level images”. http://www.iso.org/iso/iso_catalogue/catalogue_tc/catalogue_detail.htm?csnumber=22394. Retrieved 2011-02-19. ^ JBIG2-the ultimate bi-level image coding standard, by F. Ono, W. Rucklidge, R. Arps, and C. Constantinescu, in pp. 140–143, Proceedings, 2000 International Conference on Image Processing, (Vancouver, BC, Canada), vol. 1. ^ F. Ono, W. Rucklidge, R. Arps, and C. Constantinescu, “JBIG2-the ultimate bi-level image coding standard,” Image Processing, 2000. Proceedings. 2000 International Conference on , vol.1, pp.140-143 vol.1, 2000. ^ P. Howard, F. Kossentini, B. Martins, S. Forchhammer, and W. Rucklidge, “The emerging JBIG2 standard,” Circuits and Systems for Video Technology, IEEE Transactions on , vol.8, no.7, pp.838-848, Nov 1998. Click here to download JBIG2 Lossless Compression DLL.